The fire in a survival situation (as well as in the life of every day) is essential. 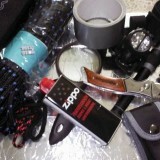 When you go on an adventure in the wilderness it is always useful to bring a lighter, or matches (preferably windproof and anti humidity), or a fire steel, or a magnesium bar. A firesteel (or fire striker) is always recommended in survival guides, because always works and lasts a long. To use it, rub the knife or any other tool against the steel bar so as to create sparks, with the right tinder you can light a good fire. To create waterproof matches soak them in liquid paraffin or in nail polish. 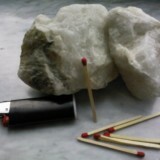 If you find rocks like pyrite and flint, you can use the sparks created by rubbing them on the tinder to light a fire. You can also rub the flint against a steel tool like a knife. If there is a hot sun you can harness the power of its rays using a lens. You can use a magnifying glass, a lens of eyeglasses, the lens of a watch, the lens of a camera, the bottom of a bottle of glass, the aluminum of a can or any other object that can concentrate the sun’s rays. Light the fire with this method requires patience and a steady hand, the time it takes to light a fire depends on the area where you are located (in an equatorial zone will light up very quickly), by the power of the rays and even by the weather. The tinder that you can use with this method must be as dark as possible (dark colors capture more sunlight). The tinder is of primary importance for starting the fire and it must be dry and soft. 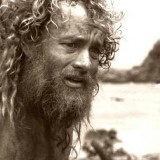 It’s always advisable to keep the tinder in a dry place and keep a stash ready to light a fire. If you have a bit of alcohol or gasoline wetting the bait to light a fire faster. Resin of pine cones and pine logs are excellent fuels, as well as the resinous oil of birch. Once the fire is lighted, you can prepare tinder for future ignitions burning parts of fibrous plants, dry wood and dung. Let themselves burn in the fire and then keep them in a dry place. Friction method: The principle of the bow drill is based on the friction, that is, on the friction between two pieces of wood. 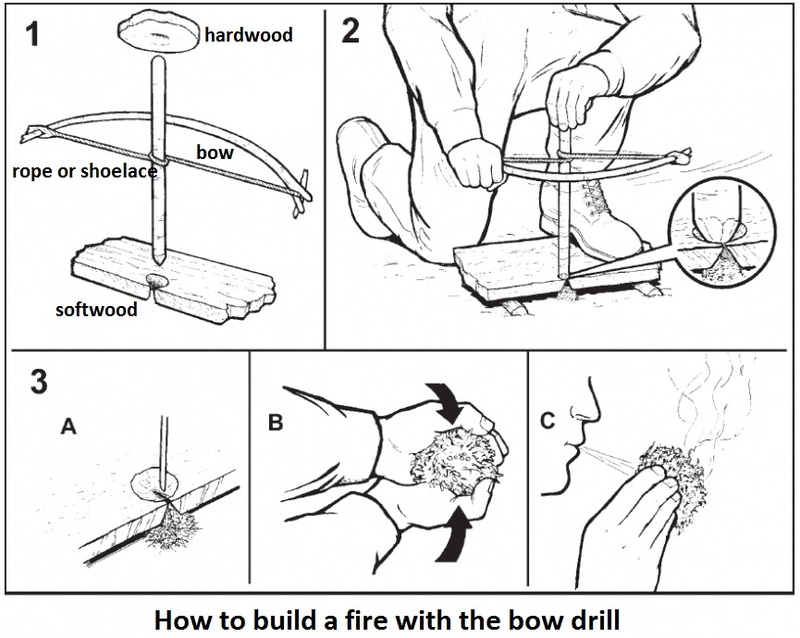 The bow drill is an ancient method of ignition and requires patience, time and effort. Get a green branch (flexible but resistant) along at least 50 cm and tie a rope at the two ends (a snare or a belt not so much tense) so as to create an arc. Wrap the rope around a stick (not resinous but dry and hard) of about 30 cm with a diameter of 2 cm. The stick will be the drill, then create a tip at one end. In order not to injure your hand when you will put pressure on the stick cover the upper tip with a hard wood, a convex stone, or a shell. Now, prepare a thick dry wood tablet at least 1 cm, which will serve as the basis. Never use resinous wood such as pine, but choose wood such as willow or poplar. On the wider side of the tablet (at least 1 cm from the edge) make a hole not so deep, while at the bottom make a groove in the shape of inverted V, which will serve to collect dust produced by rubbing with the bow drill. Place the stick in the hole in the table and holding it steady with the foot rotate the drill by moving back and forth the bow (as is done with a saw). 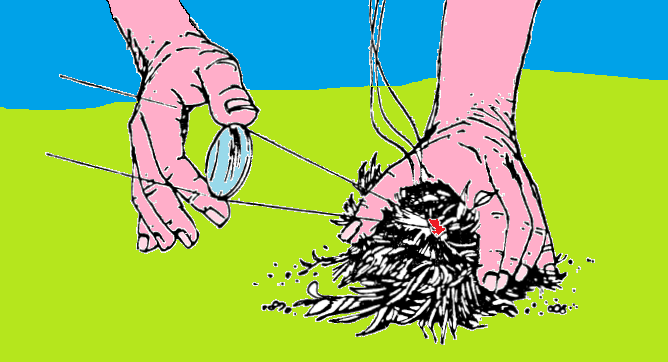 By rubbing it will create the blackish dust, that is where it will form the spark. When you feel the smell of burning increase speed. The drill runs better if lubricated with a little grease. If it is too hard you need to add more rope around it. Don’t stop when you perform the movement because the area cools down quickly and then you’ll have to start over. When in the V engraving there is enough blackish dust, put the tinder on it and blown slowly. When you create the flame, add more tinder and then put it into the firewood. 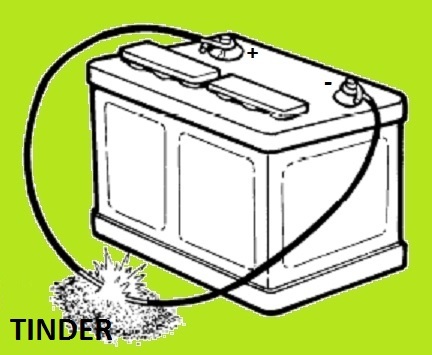 To light a fire you can also use the battery of a vehicle. Connect the two conductor wires to the respective two poles (+ / -) of the accumulator, then connect the two ends of the wires to a bare wire that passes between the tinder. The wire connected to the two conductor wires will become increasingly hot and will light the tinder. As soon as the fire is lit remove the battery and wires. CAUTION: keep the battery away from sparks, heat and flames as it may explode and cause you serious injury. 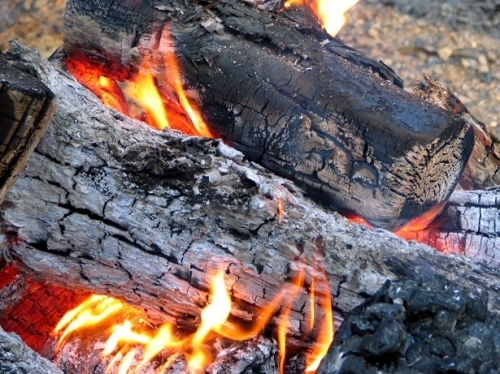 Many small fires give off more heat than a single large fire. A large fire is also more difficult to be stocked and to control. The stones too soft, wet, porous or that contain moisture, if placed on the fire they may explode causing serious injury. To light a fire choose a place sheltered from the wind so as not to disperse the heat and to make it last longer, for example, close to a wall. Please remember that the coals heat up more of the flame and are great for roasting, while the flame is more useful to boil and cook. If you are victims of an accident, you can exploit the parts of the vehicle destroyed. For example you can use the mirrors and the glass to light a fire or to build a heliograph, the interiors of seats as tinder, and the gasoline as a fuel or to create black smoke to signaling (being careful to handle it). 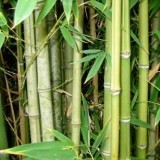 THE MOIST WOOD: produces smoke and can be used to keep away annoying insects. THE GREEN WOOD: burns slowly. 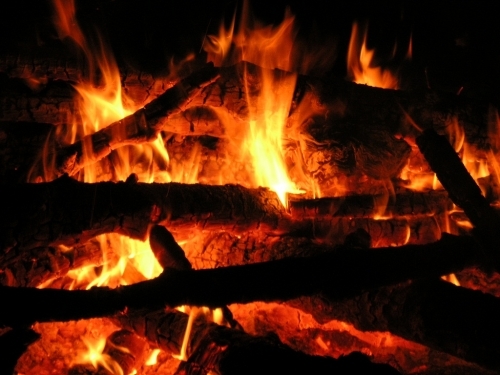 THE DRY WOOD: burns more easily and produces a clear and strong flame. THE SOFTWOOD: does more light than THE HARDWOOD.